This book is about the power of a dream, about being brave enough to choose the unique lifestyle that fulfills you. It is about the choices the women of HOPEFUL have made with the men they love. Elizabeth is not only Logan's fiance, she is his partner in play. They enjoy a D/s relationship that fulfills them fully, neither ever forgetting the magical night when Logan's love gave her the strength to let go of her past. 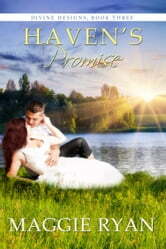 When Logan informs her of what he wants the first ceremony performed at Haven to be, is she ready to take that step? Barbara has shed her business suit for the comfort of Craig's arms. As Bunny, his special Little, she is learning all sorts of lessons, and loving every one - even when she's face down over his lap as he drills his discipline home with the palm of his hand. Having discovered that she loves, and thrives on, their special kind of relationship, is she ready to explore that side of herself more deeply? Garrett adores Ariel, the feisty woman who manages to get herself into all sorts of situations with her mischievous, impulsive spirit. She might drive him to distraction with her antics, but he's determined to spend the rest of his life taking her in hand. They continue to explore their relationship, and the darker needs they both have. But will Logan be able to accept that his baby sister has grown into a strong, beautiful woman, capable of making her own choices? Nancy is thrilled to be helping Haven come to life. She loves nothing more than to design, shop, and spend time with her fellow club members. Her husband, Jason, has the patience of a saint, and allows his creative wife the room she needs to spread her wings. He knows she will never fly too far. When he feels her stepping out of bounds, he knows exactly how to bring her back: that while his wife loves the smell of leather, she doesn’t particularly love it when that same leather is being applied to her backside. Life is full of choices. What choices will these couples make? How will their lives be transformed even as they watch the old, ramshackle house be turned into the hotel of their dreams? Are they all ready to share the promise of Haven? Don't miss this, the third book of the Divine Design series by best-selling author Maggie Ryan.